Tripoli Council head Abdulrauf Beitelmal was kidnapped early this morning from his home (Photo: ECR). The head of Tripoli Municipality Council, Abdulrauf Beitelmal, was kidnapped from his home in the Khalat Al-Furjan area, in the south of Tripoli, by unknown militias just after Midnight today. His whereabouts are still unknown. However, some sources are suggesting that he was ”arrested” by nominally official security forces for ”questioning” on spending council money. Others say this is a fig-leaf cover since he was detained just after midnight by use of excessive force. The Serraj administration has made no comments on the incident. In a statement released today, Tripoli Municipality confirmed his kidnapping through the use of force. Tripoli Municipality called on all residents of the capital and the Presidency Council of Faiez Serraj to take all the necessary action needed for his release. The statement also warned that the kidnapping endangers the formation of a civilian Libyan state and could lead the capital to unknown consequences. As a result, Tripoli Municipality has announced that it is suspending its work as of today in protest at Beitelmal’s kidnapping. The kidnapping was condemned by British ambassador David Baker who tweeted ‘‘Very concerned about the kidnapping of Tripoli Mayor. Hope he’s freed safely soon. Organized crime is a big threat to Libyan people’s safety’’. 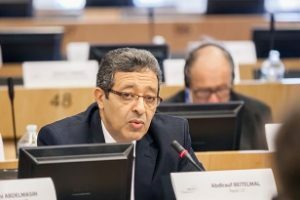 Meanwhile, the NGO, the Libyan Observatory for the Defence of Rights and Freedom, warned yesterday against the rising and continuing phenomenon of abductions and kidnappings in Libya by what it referred to as those who oppose the formation of a state of the rule of law. It will be recalled that there has been a spate of high profile kidnappings recently after a relative hiatus. Recently the Presidency Council’s Military Prosecutor Masoud Rahouma and former General Union of Chambers of Commerce head Juma Al-Ustal, were kidnapped and their fates are still unknown.